John, Paul, George and Ringo are chased around the world by a cult leader who wants Ringo's mysterious ring. With frequent pauses to render hits such as "Help!" and "Ticket to Ride", the boys tangle with a shrinking potion and a death ray. And now my life has changed in oh so many ways: I first saw Help! back in late 1980, back when I was a 13-year-old Beatles fanatic. Help! ran as a special midnight showing at a local theater and I cajoled my parents to take me. To me, this was a big deal. We now take for granted the easy availability of movies on home video formats, but in 1980, it wasn't quite so simple. Sure, VHS and Beta were out there, but they had not yet reached a price level that was readily affordable for the average consumer, and the amount of software available was pretty limited. The same was true for other formats like laserdisc. So as a kid in 1980, I either took in the rare theatrical screening of a Beatles picture or I hoped for an even-rarer TV showing. How desperate a situation was this at the time? Well, in the summer of 1980, my family spent some time in Minnesota for my grandparents' fiftieth wedding anniversary. During the week or so we were there, a local drive-in ran a triple feature of FM, The Buddy Holly Story, and Let It Be. My father knew how much this meant to me, so he was kind enough to take me to the showing. Of course, Let It Be ran last, and since the first movie didn't start until about 9 PM, that meant the Beatles wouldn't hit the screen until around 1 AM. My luck being rather poor, we experienced a massive hail storm midway through Let It Be and they had to stop the film for a while. I wasn't to be dissuaded that easily, so my Dad and I and one other car stuck it out all the way until it ended. Of course, everything is different now. (Well, sort of - Let It Be has been out of print in any video format for many years - I might have to head back to Minnesota if I want to check it out again.) Other than Let It Be, I can absorb Beatles videos to my heart's delight. A Hard Day’s Night, Yellow Submarine and others can be viewed whenever I'd like. 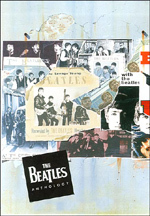 And let's not forget all of the stuff I never dreamed of when I was a kid: do you know how many people I would have gladly killed for a copy of The Beatles Anthology? While I'm still quite fond of them, I'm not nearly the Beatles fanatic that I was 30-plus years ago. Still, a certain feeling of joy comes over me whenever I watch something of theirs on home video, since I recognize just how much the 13-year-old me would have delighted in the material. Of course, some vague nostalgic glee won't keep me interested in the material. Back then, I was just so darned happy to see the films that it wouldn't have mattered if they were any good; that ain't the case now. So how does Help! hold up? Decently, I'd say. It was never the greatest film to begin with, as it couldn't live up to the high standards set with A Hard Day's Night. Help! tried to have its cake and eat it, too, as it attempted to replicate the glibness of the earlier film but also expanded to include an actual story and make a spoof of the James Bond films. As a comedy, Help! works on an intermittent basis. It's never as funny or clever as its predecessor, and the humor frequently seems forced. Still, it offers some good bits, such as a villain who emulates Odd Job from Goldfinger with a coonskin cap, and even the weakest parts aren't terrible. Actually, the film seems to improve as it goes along, as I definitely preferred the second half to the first. It appeared that everyone stopped trying quite so hard to be all things to all people and relaxed to some degree. As in A Hard Day's Night, the Beatles essentially play stereotypical versions of themselves. John and especially Ringo received the best reception for their work in the first film, so they carry most of the load during Help!. That means Paul and George aren't left with a lot to do. Actually, that latter point is what's mainly wrong with Help! : there's too much emphasis on story and supporting characters and not enough footage of the Beatles being "themselves". Unlike the first film, they all seem somewhat disconnected from each other here, so while we still get the witty banter, it comes across more as lines read from a page. The supporting characters play much more prominent roles than they had in A Hard Day's Night; at times, it seems like the Beatles are the support, not the other way around. It's still a fun movie, though. The film throws out so much comedic material during its 90 minutes that some of it had to stick, so Help! offers enough entertainment to remain worth watching. Plus, it's always nice just to watch the Beatles play, even if they're lip-synching. Help! appears in an aspect ratio of 1.66:1 on this Blu-ray Disc. Though the film didn’t dazzle, it looked generally good. Sharpness could be up and down. Though most shots displayed pretty positive delineation, wide elements tended to be somewhat soft. The vast majority of the film looked reasonably concise and well-defined, though. I noticed no issues with jagged edges or shimmering but edge haloes could distract. No artificial defects popped up along the way in this clean image, and with a natural layer of grain, I didn’t suspect any digital noise reduction. Colors looked nice. The movie boasted a broad, vivid palette that the disc presented in a lively, dynamic manner. Blacks were deep and firm, while shadows seemed clear and easily discernible. While the movie remained appealing, the issues with definition and edge haloes created some mild problems. In terms of audio, we got a DTS-HD MA 5.1 mix. We also found a PCM stereo track but not the movie’s original monaural mix. That created a disappointment, as I’d like to have the audio that accompanied the film’s theatrical exhibition. That said, I felt pleased with this 5.1 track. The movie didn’t attempt to dazzle with its soundfield. Effects created a good sense of place but didn’t overwhelm. Most of the material stayed in the realm of general ambience, without many scenes that broadened matters in a significant way. The elements usually focused on the front, as the surrounds opened up with street noise, planes, and other mild effects but not much else. Except for music, of course. The songs and score boasted good stereo imaging and also made interesting use of the surrounds. I wouldn’t classify the remixes as being gimmicky, since they placed music in the rear in a pretty subtle manner. We did get some percussion and reinforcement of the music from the surrounds, though, and the whole thing blended together well. Music also presented the best sounding aspects of the track. The songs were warm and dynamic, as they replicated the source tunes well. The score fared even better, as the orchestral elements seemed really lively and full. We’d expect a Beatles movie to offer solid musical reproduction, and Help! gave that to us. The rest of the track didn’t excel to the same degree, but it seemed fine. Speech tended to be a little reedy and occasionally edgy, but the lines always seemed intelligible. Effects were also a little thin, though not to a problematic degree. A few effects packed a minor punch, and they all offered better than average reproduction given their age. While I thought the elements other than the music didn’t impress enough to knock my grade up to “A”-level, I still felt happy with this solid remix. How did the Blu-ray compare to the 2007 DVD? Audio was a bit bolder and livelier, and visuals seemed tighter and better developed as well. However, the issues with softness and haloes meant this wasn’t as big an upgrade as I’d like. Honestly, I suspect it came from the same transfer created back in 2007, so it benefited from the strengths inherent in Blu-ray but didn’t get the boost a new transfer could offer. The DVD’s extras repeat here. 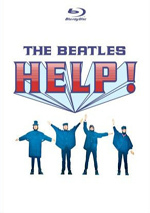 First comes a documentary called The Beatles in Help!. This 29-minute and 34-second piece mixes movie clips, archival elements and interviews. We hear from director Richard Lester, director of photography David Watkin, hair and makeup artist Betty Glasow, Apple Corps’ Neil Aspinall, stunt doubles Peter Cheevers and Chris Diggins, costume designer Julie Harris, music video/film director Steve Barron, and actor Eleanor Bron. George Harrison, Paul McCartney, John Lennon, Ringo Starr and Brian Epstein appear via period comments. 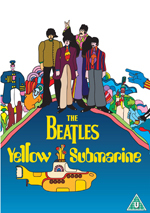 The program looks at the genesis of the story and script, the Beatles involvement and acting, additional casting, dealing with Beatlemania, sets and locations, Lester’s interaction with the Beatles, drug use during the production, cinematography, musical numbers, some shoot specifics, costumes, and general thoughts. We get a decent overview of the production thought this piece. At times it veers more into Beatles worship territory than actual documentation, but it reveals enough useful details about the flick to justify its existence. Add to that a nice collection of archival bits and this is an enjoyable show. Next comes a missing scene. Alas, this three-minute and 59-second piece fails to show any actual film footage. Instead, we get reminiscences from Lester, Watkin, Glasow, and actor Wendy Richard. We hear about the lost scene and get some thoughts related to it. It’s too bad the footage apparently no longer exists, but it’s good to learn a little about it. Two featurettes follow. The Restoration of Help! lasts 11 minutes, 29 seconds and includes comments from film restoration supervisor Paul Rutan, digital color restoration Paul Westerbeck, team manager Ken Blaustein, digital restoration artists Kevin Kuwada and Todd Smith, and film color grader Sharol Olson. These kinds of featurettes inevitably tend to become self-congratulatory, and a little of that happens here. Nonetheless, “Restoration” usually acts as a good tutorial on the techniques used to bring a transfer up to snuff in 2007. Memories of Help! goes for six minutes, 25 seconds and features Lester, Bron, Cheevers, Diggins, Watkin, Harris, Glasow, Aspinall, and actor Victor Spinetti. “Memories” essentially acts as a repository for interview snippets left out of the longer documentary. This makes it disjointed, as it follows no coherent path, but some good stories emerge. Three theatrical trailers appear. We get two US ads and one from Spain. We can also find six radio spots hidden in various menus. Four appear on the main menu, and the other two show up in the “Extras” page. Finally, the set includes a 16-page booklet. This piece presents Beatle photos and two essays. Director Richard Lester provides some brief memories of the film’s creation while Martin Scorsese gives us an appreciation for the Beatles, Lester, and the flick. These add a nice touch. Unfortunately, this disc doesn’t carry over all the extras from the 1998 DVD. It loses a short interview with Lester as well as his famous Running, Jumping and Standing Still Film. It also drops trailers for other Beatle products, some cast and crew biographies, news reels and a bit of behind the scenes footage. Help! 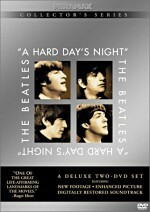 hasn't aged quite as well as A Hard Day's Night, but it still offers some solid entertainment for Beatles fans. For all of its faults, it remains a fun film that gives us a not-so-candid look at a great band in their prime. The Blu-ray offered very good audio along with erratic visuals and decent bonus materials. This is the best Help! has looked on home video, but I suspect it could’ve been better. To rate this film, visit the Special Edition review of HELP!